That same month also saw two near-disastrous attempts by rival teams—also covered by NOVA; one headed by Virgin Atlantic tycoon and balloonist Richard Branson, the other by a European duo backed by the Breitling watch company. Undaunted, all teams are planning to launch again this winter, the prime season for catching jet stream winds that circle the northern hemisphere. Only Fossett is flying solo on the estimated two to three week trip. In addition, three other teams have announced their plans to join the race, including a team who will make their attempt from Australia, ascending to an altitude of 130,000 feet. In all, six teams are scheduled for attempts in either December 1997 or January 1998. 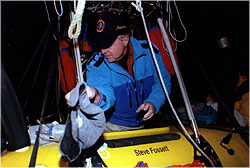 The initial long-shot underdog, Fossett's persistence and low-budget, incremental approach took him one-tenth of the way around the planet on his trouble-plagued first flight in 1996, nearly half way around on his impressive 1997 attempt, and makes him the odds-on favorite to go all the way this time. And if he doesn't, he's sure to try again. Fossett recently briefed NOVA on his past, present, and future adventures from his Colorado ski home. NOVA: When do you launch? FOSSETT: Probably this January, with a small possibility of a launch in the last half of December. NOVA: Given the close calls that you and your competitors have had, do you consider this a high-risk endeavor? FOSSETT: Yes, it is a dangerous sport. In recent years we've done distance ballooning safely, by and large. But in the 'seventies many people were lost trying to make the first flight over the Atlantic. NOVA: Why were there so many fatalities then? FOSSETT: They didn't understand the meteorology very well back then. We're far more sophisticated in predicting our flight paths now. They were also flying gas balloons, which have some problems. But we're not immune to the danger with the equipment we're now flying. Richard Branson had a rather desperate situation this last year. It's still dangerous. NOVA: What improvements in ballooning have made these long-distance attempts feasible? FOSSETT: It's the invention of the Rozière balloon in the early 'eighties by Donald Cameron that makes it possible to stay up long enough to go around the world, which hot air or gas balloons can't really do. A hot air balloon requires a great deal of fuel to keep it aloft, so that you can't fly it even for one day. A gas balloon, which usually uses helium, has the problem that the helium cools at night when the sun is not on it, and you have to throw ballast overboard to keep it from going to the surface. The next day, when the balloon warms as the sun comes up again, it actually starts to fly too high, and you have to valve out helium. Practically speaking you can't make a gas balloon big enough to do that cycle for more than about five days, and an around-the-world flight could take up to three weeks. The Rozière is basically a gas balloon, but instead of ballast we carry fuel and a hot air burner to warm the helium at night, which is much more efficient than carrying ballast. NOVA: What's different about your balloon this time? FOSSETT: My balloon is twenty-eight percent larger, which enables me to carry fifty percent more fuel. Last year the reason I had to land was that I didn't have sufficient fuel to make it across the Pacific, and I chose to land in India. This new configuration allows me to carry a buffer of fuel, so that there won't be any question about having enough. NOVA: Are you shooting for the same altitude range as last time? FOSSETT: No, I'll fly a little bit higher. My initial altitude will be 20,000 feet, instead of 18,000 last year, although my eventual cruising altitude is likely to be the same, which is 24,000. NOVA: You'll be using oxygen? FOSSETT: I have full time oxygen available to me by mask. Last year I only had to use it half the time in the early days of the flight, until I got more adjusted to things. NOVA: I don't know how you felt at the end of the last flight but you looked like you'd just gotten off of Apollo 13. FOSSETT: Yes, I was very tired. I got two hours of sleep a day, which is not enough, although four hours would be sufficient. In order to get more sleep this time I'm going to try to reduce the amount of air-traffic control communication that I have to do, so that I'm not constantly on the radio. NOVA: Your last flight lasted a little over six days. Do you think you can handle a three-week flight? FOSSETT: Yes, I'll be capable of staying aloft for twenty-two days. Just a year ago August I sailed across the Pacific alone. That took twenty days and nine hours. That was, in fact, the solo record for sailing across the Pacific. I've also sailed across the Atlantic solo. So I've been exposed to these kinds of psychological problems before. NOVA: Can you think clearly when you've been going for days? FOSSETT: So far I have, I've made good decisions. But there's a risk of making judgment errors because of fatigue or because of the altitude effects. At one point on my last flight my team thought that I wasn't very coherent—or suspected I wasn't fully aware of the situation. NOVA: At what point was that? FOSSETT: That was soon after leaving Libya, over Sudan. But that was dispelled right away when I laid out a whole new set of objectives for the flight, and they immediately recognized that I was still up there working and thinking. NOVA: What do you see as the biggest danger? FOSSETT: I think the shoot-down risk is the biggest danger. It was just two years ago in a balloon race when two American balloonists were shot down and killed in Belarus. In fact, they had permission to fly over the country but the military base over which they were flying wasn't aware that they had permission. NOVA: What route will you take? FOSSETT: The alternatives, depending on the weather, will be first, the northern course, which would take me from the United States, up to southern England, then over to south of Moscow, Kazakhstan, China, to southern Japan—or the southern route, which I took last time, which was straight across northern Africa and India in order to get to southern Japan. But southern Japan is where I want to be when I start across the Pacific. FOSSETT: That's just where the wind stream is proper, so that I won't get stalled while midway across the Pacific. NOVA: If you do end up going over Libya, as you did last time, have you been able to line up permission in advance? FOSSETT: I think the fact that Libya granted permission last year, finally, makes it more likely that they'll grant permission in advance this year, although I don't have it yet. NOVA: Since you could end up anywhere in the northern hemisphere, do you carry maps for the entire northern half of the world? FOSSETT: Yes, about twenty pounds of aeronautical charts altogether. NOVA: Someone in the NOVA program mentioned that you take War and Peace. Is that a joke? FOSSETT: Must have been a joke. I do have some books, but in all the distance flights I've made I've never opened the books. I've been too busy. NOVA: Do you have time to be a tourist? FOSSETT: Oh, yes, and it's fascinating. Last time I flew right over Cape Hatteras. That night I flew directly over Hamilton, Bermuda, which is an interesting sight because it looks like a regular city except you're out in the middle of the Atlantic. We flew over Gibraltar. When I went down through Algeria I flew across the sand dunes of the Sahara which are vast and trackless; there are no dirt roads like in deserts you fly over in the United States. I went directly over the Aswan Dam, and directly over the Strait of Hormuz. So the sights are spectacular. NOVA: What is the pleasure you get from one of these extremely strenuous, lonely trips? FOSSETT: I'm not doing it for the pleasure. This is an endeavor. It's something that hasn't been done. And it's an opportunity to earn a place in aviation history. NOVA: When you make this around the world balloon flight, what's next for you? FOSSETT: I've given a lot of thought about what to do in the future. I have a lot of ideas. Probably the next that I'll work on is sailing around the world for the speed record. NOVA: I understand you've climbed the highest mountains on six of the seven continents. Mount Everest would make it seven out of seven. Are you going to go for it? FOSSETT: No, that's off my list. I've been on two expeditions and don't plan to go back. I was never comfortable with the risk of climbing in the Himalayas, or the amount of time in idleness that is involved in the Everest expedition. NOVA: Is long-distance balloon flying any safer? FOSSETT: No, I wouldn't say that balloons are necessarily safer than Himalayan mountain climbing. They're both dangerous sports. I finally decided that Everest wasn't for me. NOVA: Do you ever feel like Lindbergh? He had a similar approach to yours. FOSSETT: I suppose there are a lot of parallels. I've chosen my way of doing this because I think it's the best way for me to do it. But the parallels are apparent—from taking less-complex equipment, which proved to be more reliable, to flying solo. NOVA: Good luck, I hope you make it. FOSSETT: I hope so, then I don't have to try again. NOVA: There'll be ticker tape parade at the end of it I'm sure. FOSSETT: No there won't. Times have changed.